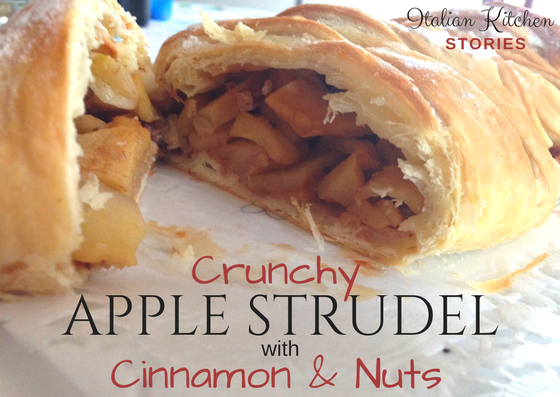 When I think about desserts many come to my mind, but for sure Apple Strudel is at the top of the list. 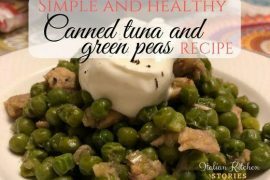 Its so easy to make, that even my boyfriend makes it when he wants to eat something sweet. Ingredients are simple and easy, that even your kids can make this dessert with some of your assistance (using the oven and knife). We usually buy a lot of fruit and it happens that when we get too much, apples are typically the last one to be finished. By staying too long in our fruit basket, we get wrinkly apples, but still amazingly sweet and delicious. I would actually say that I don’t recommend using fresh juicy apples, but those that have been sitting around for a bit. In that way, you will not have your strudel swimming in the juice while baking. 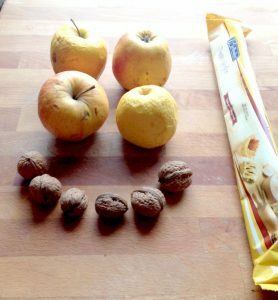 So, follow the easy steps and make your first Italian strudel. Peel the apples and slice them on even layers (I don’t grate them because we like chunky texture, but if you are serving it to small kids or elderly, you might also grate them for finer texture). 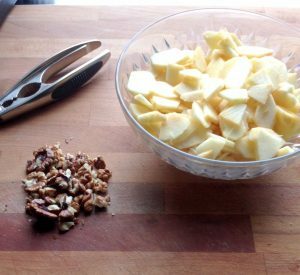 Take a big bowl and place sliced apples, add sugar, ground cinnamon and chunks of walnuts (optional) for a nice crunchy texture. Mix it all with your hands, so that sugar and cinnamon wrap around each slice. Once its all covered add bread crumbs and mix all again. Bread crumbs will absorb the liquid from the apples during the baking and as a result you will get moist texture inside and crunchy on the outside. Take the pastry from your fridge and turn your oven to 200 C (while you are preparing the strudel, your oven will reach the perfect temperature). 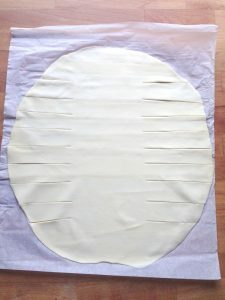 Lay the pastry on wooden board and flatten it a bit with your rolling pin. Don’t press too much, just give it a nice roll. Now make the long strips on both sides leaving the middle part untouched. Stripes should be about one and a half finger wide, leaving the last top and bottom about 4 fingers wide for an easier closure of the strudel. 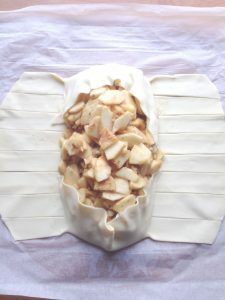 Place the apples in the middle of the pastry and flip the top and bottom cover of the apple strudel. Form with both of your hands a half moon pressing lightly toward the apples. Then take one strip and gently cross it over to the other end of the strudel. You need to cross the strips from one side to another like you are making a braid until you have used up almost all of the pastry. 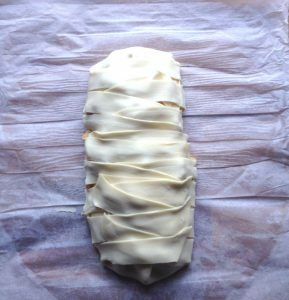 Lift up your apple strudel with the baking paper and place it in the baking tray. I bake it usually for 25 min on 200 C ventilated oven. You can do it between 20 and 28 minutes, depending on your oven and pastry type. I know that my apple strudel is done when I see that it got a golden glow. Once it’s baked, let your apple strudel cool for a bit before you sprinkle it with powdered sugar. We like to cut the nice wide slices as that will help you keep the apples in one place. While it’s still warm you can serve it with vanilla ice cream. 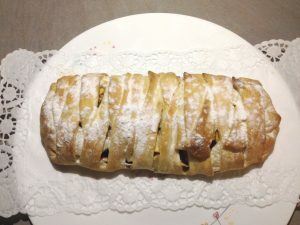 Note: If you like raisins feel free to add it into the apple strudel as it will enhance it’s natural sweet taste. I hope you will try this amazingly easy to make dessert, even beginner can make.